This issue of Lake Effect Living looks at the unique Northern Rustics in downtown Holland. If you're interested in furnishing a lake cabin or north woods lodge, this should be your first stop. Whether your shopping list includes an Amish crafted table, fragrant nature-scented diffusers, or a rustic chandelier, owners John and Debi Whelan have selected a wide variety of home decor, food products and childrens' gifts. You can purchase an item as large as a bedroom set or as small as a coaster. And you may want to bring a camera. 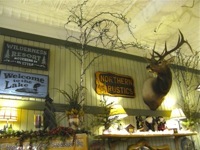 The imposing mounted animal heads that decorate the store walls are real. Originally built as a fast ship to transport fruit, the SS Eastland was known as the "Speed Queen of the Great Lakes". A subsequent owner converted the ship to a lake passenger steamer with a 2570 person capacity. On the warm summer morning of July 24, 1915 her design flaws were to produce the largest loss of life aboard a single ship on the Great Lakes when the Eastland capsized beside the dock in the calm waters of the Chicago River. No need to roast another turkey or holiday ham. If you're entertaining this season - and who isn't? - try something a little different. From a warm appetizer of wild mushroom toast, followed by a tasty winter salad, your guests will be primed for the main course: Alaska Salmon, rosemary potatoes and classic hot biscuits. And don't forget the light but delicious Noel pound cake. Don't forget to read the Calendar of Events for December and January. December is bursting with holiday concerts, winter greenmarkets and Santa parades. The pace slows in January but there's still a number of area activities, including Chili Cook-Offs, winter races and art exhibits. And just because it has turned cold, don't forget about our beaches. Winter changes everything about a Lake Michigan beach. Sand becomes frozen hard and easy to walk on. Waves form exotic windswept ice berms on the shore. Lake Effect Living has compiled a list of beaches for you to explore and enjoy their stark winter beauty. Unlike summer, you'll have no trouble finding a parking space either. T'is the season for Christmas trees. Check out our page devoted to Christmas Tree Farms along the lakeshore if you're searching for fresh-cut trees, wreaths or garlands. Or maybe you're just in the mood for a sleigh ride. And although we enjoyed a mild autumn, we all know that lake effect snow is on the way. When it arrives, remember to look over our Skiing on the Lakeshore section for the best trails and slopes in southwest Michigan.